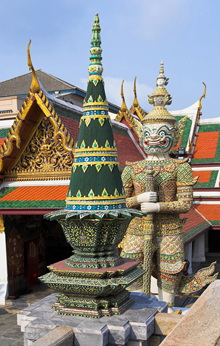 Grand Palace in Bangkok — The Grand Palace in Bangkok is a complex of buildings in Bangkok, Thailand. It served as the official residence of the Kings of Thailand from the 18th century onwards. Construction of the Palace began in 1782, during the reign of King Rama I, when he moved the capital across the river from Thonburi to Bangkok. THAILAND — Bangkok regains the top spot in Travel + Leisure’s 2010 World’s Best Awards readers’ survey, announced earlier today, closely followed by Chiang Mai in the second spot, followed by Kyoto and Siem Reap. Meanwhile, 10 Asian hotels are placed in the top 100 hotels in the world, with Peninsula Bangkok (named as Asia’s number 1 city hotel) coming in at number 7 and Four Seasons Singapore at 14. Other Asian properties placed in the list’s top 50 include Shangri-La Singapore at number 20, the Four Seasons Resort in Chiang Mai (27), theHotel de la Paix in Cambodia (29) and the Mandarin Oriental Dhara Devi, also in Chiang Mai (45). Also scoring highly in the poll, voted for by readers of all six global editions of Travel + Leisure,are Singapore Airlines (Top International Airline) and Bali (Top Asian Island and fourth in the Top Islands Overall category). The full results will be published in the August edition of Travel + Leisure Southeast Asia. With an eye for the authentic, the innovative, and the irresistible, Travel + Leisure fuses expert reporting on culture, food, style, and design with stunning photography, transporting readers to the places—and the travel experiences—that mat-ter now. T+L (U.S.), the monthly title from American Express Publishing and the long-standing authority in its field, has the largest audience of any travel magazine and is an indispensable guide for global nomads. Travel + Leisure has anetwork of international editions, including Travel + Leisure Mexico, Travel + Leisure Turkey, Travel + Leisure China, Travel + Leisure South Asia, and Travel + Leisure Southeast Asia. The full results are summarized overleafTravel + Leisure Southeast Asia is published by Media Transasia Ltd., under license from American ExpressPublishing, 12 times a year. It is distributed Singapore, Hong Kong, Thailand, Indonesia, Malaysia, Vietnam,Macau, the Philippines, Burma, Laos, Cambodia and Brunei. Visit www.TravelandLeisureAsia.com for details.